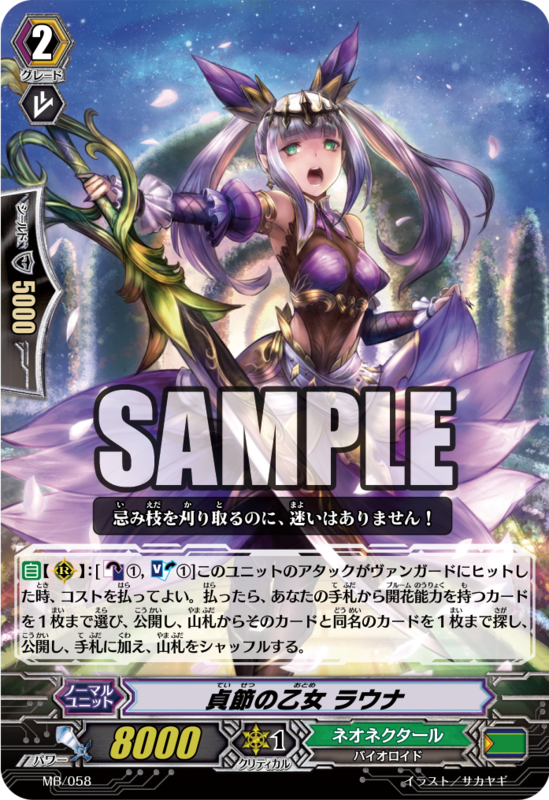 Support for Royal Paladin Brave and Neo Nectar Bloom! Cont (VC/RC) GB1 Brave: For each of your other Rear-guards with the Brave ability, this Unit gains Power+1000. Auto (RC): [Counter Blast 1 & Soul Blast 1] When this Unit’s attack hits a Vanguard, you can pay the cost. If you do, choose up to 1 card from your hand with the Bloom ability, reveal it, search your Deck for up to 1 card with the same name as that card, reveal it, add it to your hand, then shuffle the Deck.